Illustrations of arguably the most famous French executioner alongside some of his almost 400 “subjects,” colorful collages of a crow, the focus of a children’s book inspired by Edgar Allen Poe’s poem “The Raven,” striking photographs of one of this country’s most beloved natural treasures, Yellowstone National Park, and surreal images inspired by mythology and nature are featured in the winter art exhibit series recently opened in Homer Babbidge Library and on view until February 20, 2015. Surreal acrylic paintings and highly polished sculpted wood figures round out the series. Cora Lynn Deibler with some of French executioner Anatole Deibler’s “subjects” in her exhibit. Illustration professor Cora Lynn Deibler showcases her graphic novel Anatole Deibler: The Tale of Monsieur de Paris about the most famous French executioner of all time. Deibler worked from 1885 until 1939 when executions were public spectacle and when the infant media of photography and film turned him into something of a celebrity. 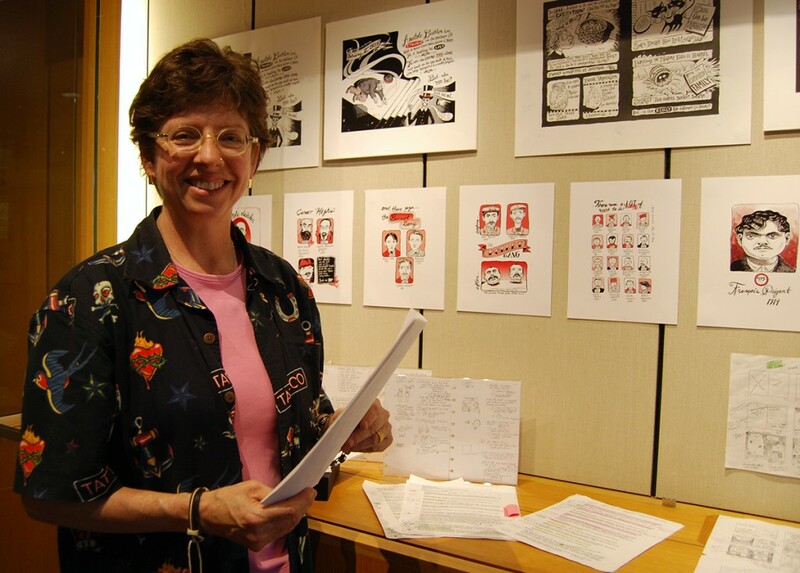 In her graphic novel, the artist showcases Deibler’s unusual career made more intriguing by the speculation that they may be distant relatives. 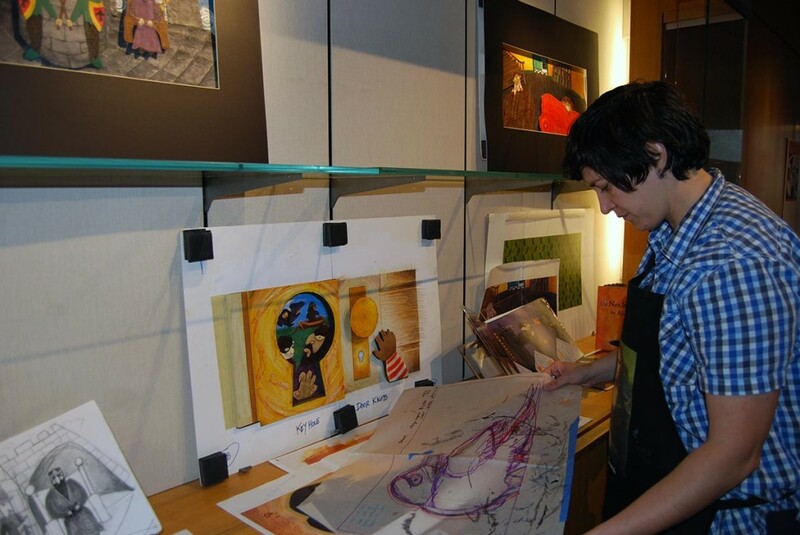 Alison Paul, who writes and illustrates children’s books for Houghton Mifflin Harcourt, exhibits work from her first book, THE CROW (A Not So Scary Story). Paul often builds dioramas for exhibition from the set pieces used in her stop-motion animation work. Two are on display. Photographer Janet Pritchard examines the relationship between nature and culture in her photographic project, Yellowstone Dream: An American Love Story. Drawing upon insights developed while a fellow at the American Antiquarian Society in Worcester, Massachusetts where she examined maps, personal stories, and expedition records, Pritchard reflects upon her own time spent in Wyoming, and how generations have invested the park with their own values since its founding in 1872. 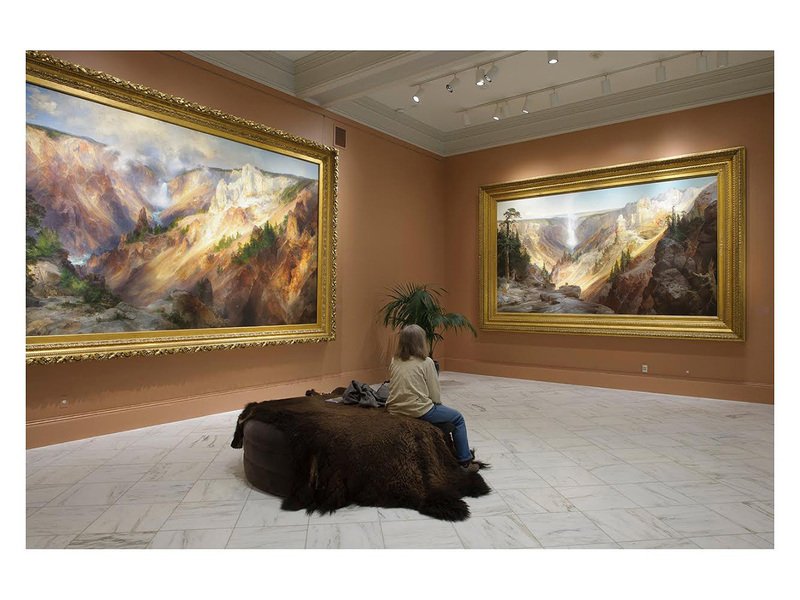 Lower Falls of the Yellowstone River, Thomas Moran, 1872 & 1893, Smithsonian. One of the images in photographer Janet Pritchard’s exhibit. 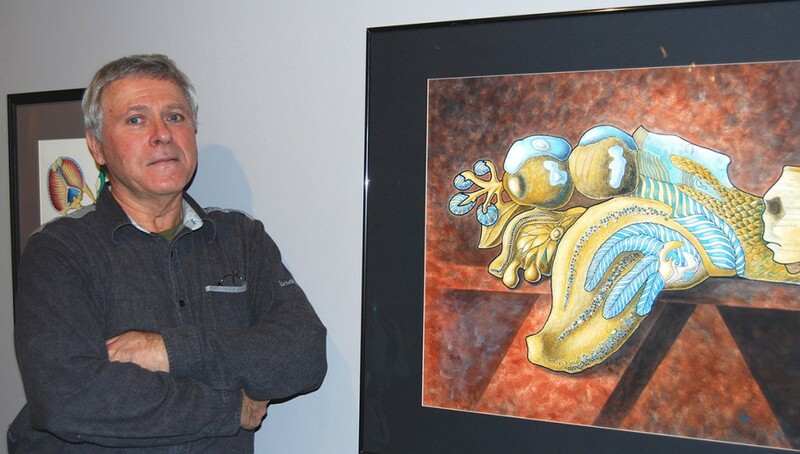 In the 1980s, Liviu Cupceancu worked in UConn’s neurobiology department doing research and creating scientific illustrations for professional journals. Now retired, the Tolland, Connecticut resident devotes his energies full time to his art. In this show, he exhibits his surreal acrylics, abstract oils, and wood sculpture. Liviu Cupceancu, a native of Romania, next to his surreal acrylic painting, Carpathian Sphinx, which draws upon elements of his homeland.